Tucked away in the records of Elbert County, Georgia, are some of the neatest genealogical records imaginable. What a window into the lives or ordinary every-day families of Elbert County! So… what the heck are these records anyway, and where can you find them? This particular set of records, from Elbert County — a county along the northeast Georgia coast — happens to be available online. 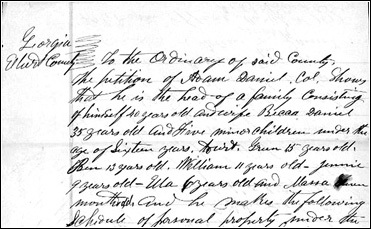 The Legal Genealogist was doing the usual poke-around-in-the-records bit last night and came across them at FamilySearch.org. And they tickled my fancy because of the title: the pony homesteads. Now we all have a pretty good idea what a homestead is — at least when we’re talking about the federal Homestead Act of 1862 and the right of individuals to claim and settle on tracts of federal land. But what’s a pony homestead? But to get the benefit of this and all the homestead exemptions, the debtor — the head of the household or other person claiming the protections of the law — had to file a schedule of property with the ordinary, the predecessor to today’s probate court. And it’s those schedules that you’ll find in this record set. The statutory protections began as far back as the laws of 1822 and, at various times, included land, one farm horse or mule, one cow and calf, up to 10 hogs, household furniture, the arms and equipment needed by a militiaman, cooking utensils, wearing apparel, the family Bible, religious works and schoolbooks, family portraits, the library of a professional man, and a family sewing machine.8 Only up to $300 worth of household items was considered the pony homestead, totally exempt even from waiver, but the filings covered all of the exempt property. I believe that these Florida homestead records are similar to the Georgia ones in their intent and purpose. Jim Powell of Alachua County, Florida, is one of my personal heroes, though (to my knowledge) he and I have never met. The digitization of the Alachua County records is one of the neatest things I’ve ever seen, and I use examples from Alachua records all the time, simply because they’re easy to get to. Great job, Jim Powell, and thanks for reminding us all of this resource, Sara! Wow, that is so cool. Judy, you come up with the neatest things to dangle in front of people like me (at 72 having a whale of a good time learning this stuff!). While none of my ancestors are from the deep south (so far as I know), this makes me wonder what similar records might exist for my ancestors elsewhere. I would love to have that kind of picture of daily life those inventories give. Gonna have to look! Thanks. Not every state will have records this good, Annie, but most states will have some type of homestead protection system. Worth checking!